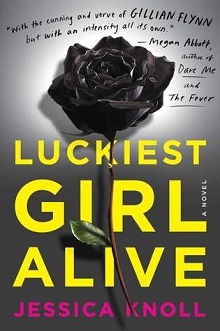 Welcome to my AudioBook review for Luckiest Girl Alive the debut offering from Jessica Knoll. While many are comparing this to Gone Girl, I found the feel of a Picoult story buried within the darker themes, interior monologues and struggles for acceptance. What happens when your entire life is obsessed with outward appearances and fitting in, but inside you are stuck on rewind? Exactly what happens to Ani (orTifAni) during this story. A difficult and often brutal story of a young woman struggling with moving forward and her own obsessions with being perceived as the “it girl”. While blurb and other reviewers tend to mention the Gone Girl like twist and tone, I found the story more reminiscent of a Jodi Picoult story: dark, difficult characters with an overall sense of doom ahead warnings. Ani has everything, or so she thinks. You will tire of her materialistic view, designer name dropping, weight obsessions and frequent vapid and shallow references to life. Because for her, to go deeper reveals all she has done and foregone to ‘fit in’ and build this caricature that fits well in the society in which she strives to belong. It’s a truly rough listen as she engenders ZERO empathy early on, and it isn’t until her past and the events during freshman year come to light that you can see why she is so very obsessed with the superficial trappings that say you have ‘arrived”. So, as a debut offering, I appreciated Knoll’s ability to weave the story that was so full of characters that were unsympathetic and often unlikable. And Ani spends far too much time bemoaning her victim status in an offhanded bitter way, while ignoring the actual elements in her life that would give her some fulfillment. A shallow puddle with few to no personal insights until the story truly starts to reveal the secrets, I didn’t give a toss about Ani herself, but was curious to see just how and why she was so broken. Beautifully revealed with flashbacks that both feel younger and contain a surprising amount of insight from TifAni, one wonders what was actually learned from the repeated mistakes and missteps, and how much time Ani has spent truly examining that time in her life. Narration is provided by Madeleine Maby and her ability to present Ani in all of her confusion and despair is wonderful. Moments from other characters are neatly presented and clearly distinct, and the addition of emotional overlay when required fits the story precisely. Her presentation feels wholly correct and twenty-something, without coming off too mature or young. While not a perfect story, Knoll does present a believable reason for Ani’s present behavior, it ultimately is a story about knowing oneself and finding the courage to face yourself without the trappings that present a more glamorous, rich or accomplished person, and just how difficult that can be in the new, bigger, better, more world of today. Jessica Knoll has been a senior editor at Cosmopolitan, and the articles editor at SELF. She grew up in the suburbs of Philadelphia and graduated from The Shipley School in Bryn Mawr, Pennsylvania, and from Hobart and William Smith Colleges in Geneva, New York. She lives in New York City with her husband.